Sydney agency SapientNitro has produced “Earphone Bully”, an interactive experience designed to help people understand the realities of playground bullying. 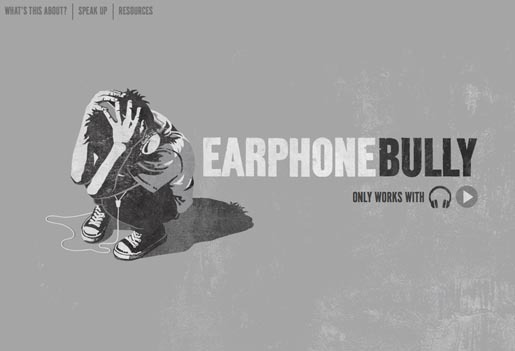 The interactive site, earphonebully.org, uses 3D sound to put users in the shoes of a silent victim, prompting people to take action. SapientNitro developed this experience in consultation with an anti-bullying professional. The site design can be easily customized by organizations anywhere in the world to add their local support. Earphone Bully knows over 500 names, so when you share it with others, it will personalize the experience using your friend’s name. The Earphone Bully campaign was developed at SapientNitro, Melbourne, by executive creative directors Nancy Hartley and James Burchill, associate creative directors/art directors Ralph Barnett and Cristian Staal, senior copywriter Marianna Harvey, digital creatives Thomas Marcusson and Dan Treichel, digital project manager Mark McCarthy, account manager Melissa Sealey. Production was done at Eardrum by director Ralph van Dijk, producer Lisa Lepore, producer Melissa Ashman, with sound designer Michael Bates, editor Chad Twentyman and designer Derek Leong.